Before we were “in the know” enough to know that the best games are generally not available at K-Mart, Paul and I used to go to K-Mart and look at games. Truthfully, we went to K-Mart to look at most things. Alice Springs, AU was a fairly uncomplicated place to live as a consumer. There was one shopping mall, but its “anchor store” was not a Dillards or Nordstrum, but a Coles grocery store. Basically the only place you could look at DVDs and home appliances in one place was the K-Mart. If you have ever said “I’m bored, wanna go wander around the mall?” Then you understand the impetus for our trips to the K-Mart. So one day, at the K-Mart, we saw these games, shrink-wrapped together as a two-pack. 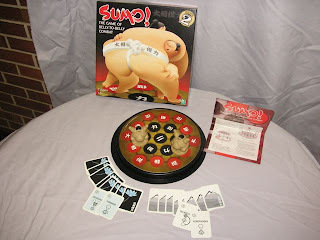 We were instantly drawn to “Sumo! The Game of Belly to Belly Combat!” and couldn’t pass it up. 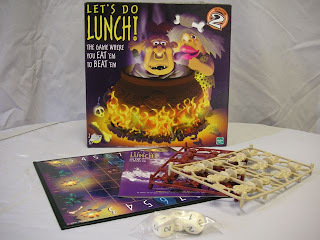 We never played “Let’s Do Lunch, Where You Eat’em to Beat’em” featuring cannibals. It was obviously the equivalent of the forgettable movie manufacturers try to foist off on you if you buy the 2-fer DVDS. 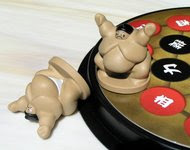 But we did play the Sumo game a couple times. We then displayed the players and board as the kitsch centerpiece on our coffee-table, where they were a source of constant joy. If your home decor is feeling stale, maybe you need these two cute wrestlers to brighten up your living space! Or if you’re just into the idea of a cannibal board game–we can do that too!